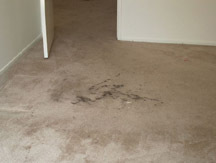 Dark Spots can be caused by food, grease, garden soil, fireplace soot, motor oil, walk-in dirt, ink, dye, beer, cocktails, butter, chocolate, coffee, crayons, eggs, mud, cough syrup, shoe polish, tar, asphalt, and many other things found in the house or business. 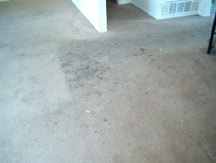 Filtration dark spots is common under a closed door, on stairs, and edges. 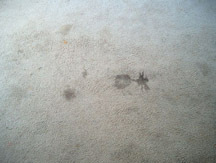 This can be found where air is forced through small cracks and collects airborne dirt and acts like a air filter. 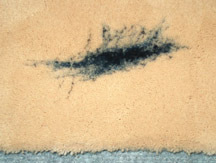 Most dark spots can be fixed by removing the color that caused it and dyeing back to the original color.